The Konkani language spoken by the Christian people of Goa has a notable difference from that of the Hindus for it is influenced a lot by the Portuguese in its vocabulary. But however during the rule of Portuguese, Konkani was suppressed to a great extent and then in the field of education especially for the Hindus, Marathi played a major role. There is a very small minority of descendants of the Portuguese, most of who are of mixed descent and speak Portuguese who are mainly educated and follow for communication the Devanagari and Latin script. The Goans are mainly happy go lucky people who always extend a warm and a friendly relationship. They are very hospitable and enjoy each and every moment of life. They live their life they wish to and are not influenced by any materialistic factors. The people of Goa follow their own religion and beliefs. During the Portuguese rule, their army and the religious zealtors destroyed the temples in this area and also converted most of the non-Christians in this area to Christianity. However the Goans basically being friendly and loving nature inspite of varying religions stand apart and they still remain united as Goans.There is no clashes among the people living in Goa regarding their religious beliefs and religious fundamentalism for they have lot of tolerance towards each other's values and customs. The culture of the Goans dates back to the early period of civilization. Though there were lot of interference from the aliens resulting in ravages, still the traditional culture of the people was strongly adhered for the Goans which gave them back a tough resistance for every challenge they faced. Goa's cultural heritage was enriched by a slow but persistent process of absorption and assimilation of the more congenial features of alien culture. With a multicultural past the Goans have rich traditional customs and rituals which are followed. The culture of the people is also influenced by the Goan cuisine. The culture of the Goans is a blend of their people, festivals, music and dance. The Goan customs and traditions are easily adaptable because of their lifestyle. The flexibility in their customs is mainly due to the fact that the place being reigned by different empires, the customs and traditions have also got a shape according to the beliefs pertaining to that period of time. Thus the people do not really consider the traditional practices too hard. But still there are certain customs and traditions which are very much adhered to like most of the houses built here follow the typical Portugal custom. Not only the old churches but also any new church constructed here follows the typical traditional Portugal style. There are no hard and fast rules to follow a particular religion for they can have the choice of their own but still respect the values of other religions too. This nature of the Goans makes them stand apart from the entire country and so their tradition and customs have truly given a unique identity to the state and made it a role model for others. The cultural heritage of the people of Goa also influences the costumes of the Goans. Generally the costumes of the people of Goa are very colourful. Lot of Portuguese taste will be very evident in the western wears of Goan men and women. However a 9-yard sari and Pano bhaju along with traditional jewelry is the main costume of the women folk of Goa. A colourful sight is a promise from the Koli fishermen group who are dressed with bright shirts and half pants, and a hat made of bark of the bamboo trees. During the Goa carnival different types of costumes of Goa and beautiful masks are show-cased. The traditional attire worn by Gauda, Kunbi, Dhangar, Velip and Zalmi tribes are mainly loincloth known as "Kashti" with a blanket on the shoulders, "Kunbi Palloo" along with a tied knot and sari. The staple food of the Goan cuisine is fish curry and rice. The food is always a mix of Konkani, Brazillian and Portuguese food styles. Apart from fish, the Catholics of Goa also eat beef and pork which is not common among the Hindus. Generally the food of the people of Goa is quite spicy. 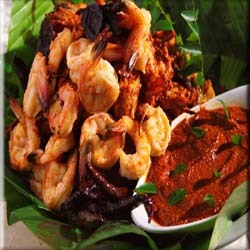 One of the most favorite sea food delicacies is the Prawn Balham which is a spicy, oily, pickle- like preparation. Another special dish which is mainly served on occasions is the Pork sorpotel. Mostly the dinner is always served with Chicken Cafreal which is a grilled preparation with a healthy amount of garlic paste. A popular desert among the Goan is a sweet meat dish named Bebinca which is very rich and is eight layered, alternated with eggs, milk and sugar.Goa's traditional drink is Feni, a potent brew made from the sap of either the coconut or cashew tree. 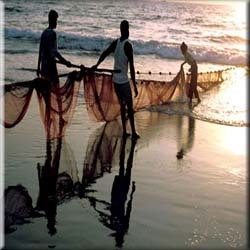 Being the coastal area, the main occupation of the people of Goa is fishing. Once the fact of being in the coast Goa also boasts of a fertile area and so agriculture is also practiced in this area. Some of the commonly cultivated crops here includes like long-length bananas, paddy, ragi, maize, jowar, bajra, pulses, the cash crops like coconut, cashew-nut, arecanut, mango, jackfruit, banana, pineapple, etc. However, one of the most important crops cultivated in the villages of Goa is cashew. Mango cultivation is also known among Goans and includes various varities like manicured, mussarade, fernandine, xavier, alfonsa, colaco, etc. Goa known for its princely beauty tourism also becomes a principal occupation of the people in the villages. They work as tourist guides, or run their own businesses in the beaches and they are also engaged in providing lodging facilities to the tourists. Lata Mangeshkar -The nightingale of India. Kishori Amonkar -Popular Indian classical singer. Leander Paes -International tennis player. Eduardo Faleiro -Prominent politician and former central minister.